This book analyses, explains, and evaluates the Government's flagship criminal justice legislation, the Criminal Justice Act 2003. It provides an accessible commentary on the wide ranging and complex changes introduced by the Act, which will leave few areas of the criminal justice system untouched. The Act starts with changes to police powers, bail, cautioning, and pre-trial disclosure, and moves on to the abolition of committal proceedings and the introduction of the possibility of trials on indictment without juries. It then goes on to provide for prosecution appeals and a broad range of offences where a trial following acquittal can exceptionally be allowed. The rules on evidence are significantly reformed providing firstly, a much wider basis on which evidence of bad character (including previous convictions) can be admitted, and secondly, for the admissibility of hearsay 'where it is not contrary to the interests of justice' to admit it. The Act also provides a major restatement and reform of the sentencing framework and the provisions for release on licence, and abolishes most of the categories of exemption from the duty to perform jury service. 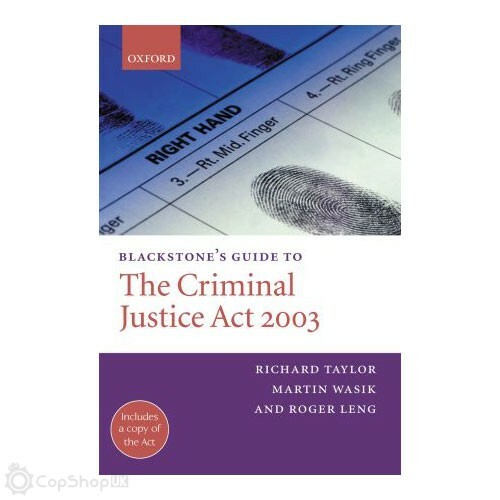 Anyone working in the Criminal Justice System or interested in its operation will welcome this guide, which provides invaluable insights into the purposes of the Act and a detailed explanation of its provisions. The book also includes the full text of the Act. All Criminal Law Practitioners: solicitors, barristers, the judiciary, magistrates, the Crown Prosecution Service, the Probation Service, the Police; academics and students of law, criminal justice, and criminology; reference libraries in the UK and worldwide.